FEATURE — Offering “Southwest Elegance with Spectacular Views,” Canyon Breeze provides a delicious, relaxing and adult-friendly dining experience at Red Mountain Resort in Ivins. Red Mountain Resort general manager Tracey Welsh says Canyon Breeze’s cuisine has always been inspired with health and wellness in mind. Although most of the restaurant’s patrons are guests at the resort, Red Mountain Resort general manager Tracey Welsh said members of the public aged 12 and older are also welcome to dine there. Breeze away with Sheldon and Indigo in Episode 21 of “What’s on the Menu” in the player above. Chad Luethje, the resort’s executive chef and food and beverage director, said the restaurant’s featured dinner entrees are on a seven-day rotation, so they change daily. Click here to see the restaurant’s schedule and menus, which are complemented by a full selection of beer, wine and other beverages. Last but certainly not least are the variety of scrumptious dessert options, including the highly popular red velvet cherry lava cake and a peach semifreddo topped with blackberry coulis. Many of the desserts are gluten-free, and vegan options are also available. Welsh says dining at Canyon Breeze is an integral part of the Red Mountain Resort experience. Welsh said resort guests stay at Red Mountain for various reasons. 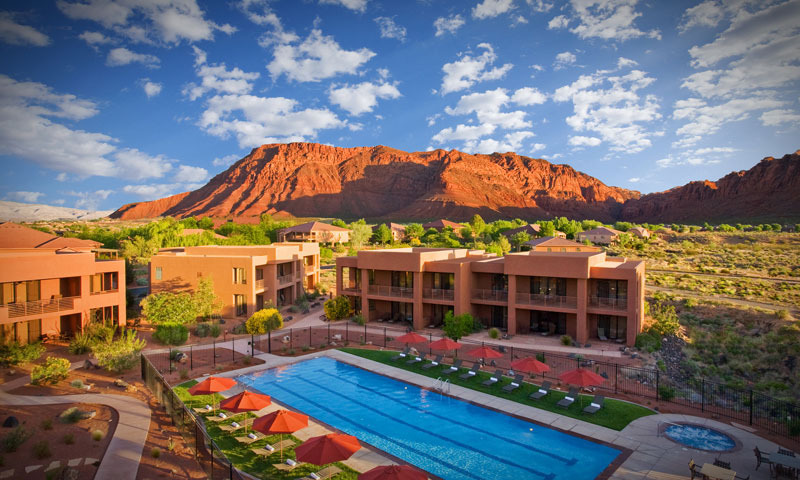 Canyon Breeze at Red Mountain Resort | Location: 1275 Red Mountain Circle, Ivins (click for map). | Breakfast buffet: 6:30-10 a.m. Lunch buffet: 11:30 a.m.-1:30 p.m. Dinner reservations: 5:30-7:30 p.m. | Telephone: 435-652-5728 | Website | Facebook.